Most studies about bullying focus on boys as aggressors but girls can be bullies too and when girls bully it can be an entirely different beast. When we think of bullying we tend to think of physical violence and outward taunting but when girls bully their tactics are often quiet and covert. From the outside looking in it can be hard to tell a group of girls who are bullying apart from a group of girls who are innocently standing around. Girls socialize differently than boys. As girls get older their peer interactions become less physical and more cerebral. Girls engage in verbal bonding by sharing stories, hopes, and dreams. Since girls bond differently than boys it makes sense that when they bully it would be different too. Teachers and parents tend to talk about the obvious when they talk about bullying. Playground scuffles, name calling, stealing personal items and damaging property are commonly cited examples of bullying behavior. But when girls bully they aren’t so obvious. Girls can be quietly vicious with their victims and adults often fail to treat their behavior as bullying. The tactics used by girls who bully are distorted versions of some normal mechanisms of social development. According to research done by Lagerspetz, Bjorqvist and Peltonen at the University of Miami, when girls bully they use things like alienation, ostracism, deliberate and calculated random exclusions, and spreading of rumors to harass their peers. Girls get other kids to gang up on one or more peers as a way of exerting control. Sometimes they entice other children to act out aggressively and sit back to watch the show. They form groups that pick and choose members at random and exclude others without real reason. They form alliances with other social groups in an effort to jockey for popularity and positions of power among peers. All too often the bullying tactics used by girls are brushed off as cruel but normal social interactions. 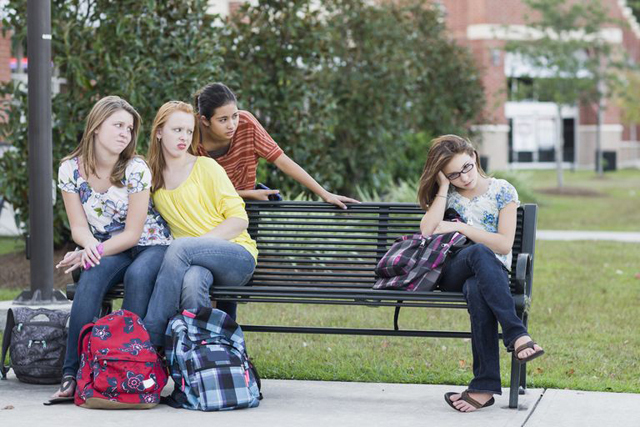 In Girls, Bullying Behaviors and Peer Relationships: The Double Edged Sword of Exclusion and Rejection, Barbara Leckie explains how bullying by girls manifests itself and how it is handled by adults. Leckie went over numerous studies dating back as far as 1980 and identified the many different ways that girls bully. She also found that adults were slower to react to the bullying tactics used by girls. If there is violence or physical acting out of any sort adults are quick to intervene and when necessary will punish offenders, but when the bullying takes on a less obvious form even adults don’t seem to know what to do. When girls bully it often goes unaddressed. Since adults don't always label the tactics used by girls as bullying kids who fall victim don’t know where to turn for help. The mindset still exists that not all kids can be friends and the social structure of the school system encourages the formation of groups and reinforces the idea of social hierarchies. This makes many adults slow to recognize things like exclusion and alienation as something sinister. These behaviors are often dismissed as an unfortunate part of the normal formation of peer groups. While it is normal for girls and boys to form social groups and close bonds with certain people at the exclusion of others it becomes bullying when those groups make power plays over other groups or individuals. Having friends is one thing; having friends who work to make others feel that they are not good enough to be included is another. Playing the popularity game in a way that causes fear or inadequacy in others is a form of bullying and it is a common tactic used by girls. Sadly, good kids who know better go along with these types of popularity power games for fear of being singled out and cast out of the group. Since adults often treat this exclusionary behavior as mere social clashing kids who are caught in the middle are afraid to stand up to the bully. It seems easier to do nothing than it does to do the right thing. Kids who quietly go along with a bully add to the bully's power by giving victims the illusion that the bully has peer support. The victim feels like everybody is against them, not just the bully. When adults do not address exclusionary behavior the same way they would address more traditionally forms of bullying it worsens the problem. Kids who know better feel powerless to do the right thing when adults don’t react. Girls who bully will pick on boys as well as other girls. They act out as consistently as boys who bully and pick their targets in much the same way. While girls have been known to get violent when they bully it is much more common for them to use emotional tactics. Boys are not the only bullies, girls bully too. Being singled out, ridiculed, excluded, or alienated is a form of bullying. Being beaten up emotionally on a daily basis does damage to the victims. It is time that the problem was addressed for what it is, a gender difference in bullying but bullying none-the-less.